This newly released image from the European Space Agency shows the outline of our Galaxy and of its neighboring Magellanic Clouds. This image, based on housekeeping data from ESA’s Gaia satellite, is no ordinary depiction of the heavens. While the image portrays the outline of our Galaxy, the Milky Way, and of its neighboring Magellanic Clouds, it was obtained in a rather unusual way. As Gaia scans the sky to measure positions and velocities of a billion stars with unprecedented accuracy, for some stars it also determines their speed across the camera’s sensor. This information is used in real time by the attitude and orbit control system to ensure the satellite’s orientation is maintained with the desired precision. These speed statistics are routinely sent to Earth, along with the science data, in the form of housekeeping data. They include the total number of stars, used in the attitude-control loop, that is detected every second in each of Gaia’s fields of view. It is the latter – which is basically an indication of the density of stars across the sky – that was used to produce this uncommon visualization of the celestial sphere. Brighter regions indicate higher concentrations of stars, while darker regions correspond to patches of the sky where fewer stars are observed. 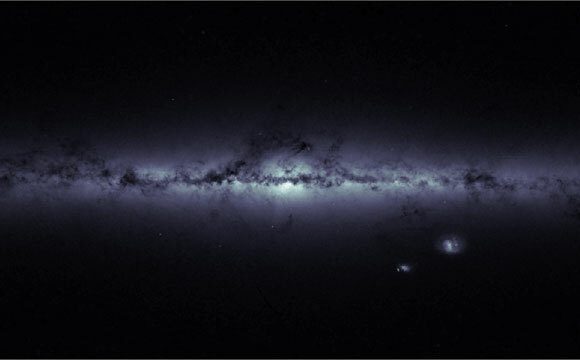 The plane of the Milky Way, where most of the Galaxy’s stars reside, is evidently the brightest portion of this image, running horizontally and especially bright at the center. Darker regions across this broad strip of stars, known as the Galactic Plane, correspond to dense, interstellar clouds of gas and dust that absorb starlight along the line of sight. The Galactic Plane is the projection on the sky of the Galactic disc, a flattened structure with a diameter of about 100,000 light-years and a vertical height of only 1000 light-years. Beyond the plane, only a few objects are visible, most notably the Large and Small Magellanic Clouds, two dwarf galaxies orbiting the Milky Way, which stand out in the lower right part of the image. A few globular clusters – large assemblies up to millions of stars held together by their mutual gravity – are also sprinkled around the Galactic Plane. Globular clusters, the oldest population of stars in the Galaxy, sit mainly in a spherical halo extending up to 100 000 light-years from the center of the Milky Way. The globular cluster NGC 104 is easily visible in the image, to the immediate left of the Small Magellanic Cloud. Other globular clusters are highlighted in an annotated version of this image. Interestingly, the majority of bright stars that are visible to the naked eye and that form the familiar constellations of the sky are not accounted for in this image because they are too bright to be used by Gaia’s control system. Similarly, the Andromeda galaxy – the largest galactic neighbor of the Milky Way – also does not stand out here. 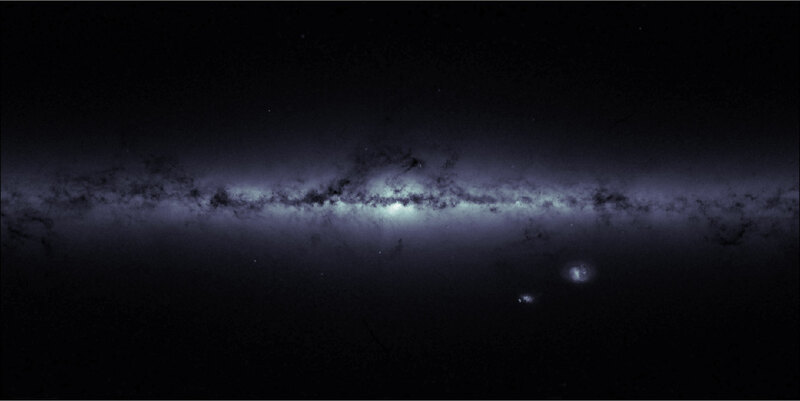 Counterintuitively, while Gaia carries a billion-pixel camera, it is not a mission aimed at imaging the sky: it is making the largest, most precise 3D map of our Galaxy, providing a crucial tool for studying the formation and evolution of the Milky Way. 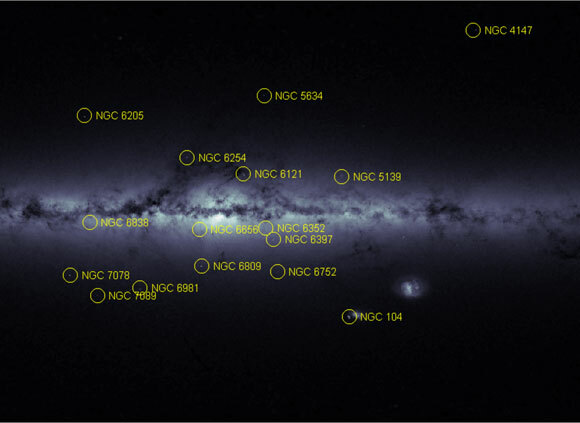 Be the first to comment on "New ESA Image of the Milky Way and of Its Neighboring Magellanic Clouds"